I think it's very natural that Victoria is the sibling who usually (but not always) is a bit more traditional. She's the heir, quite simply, with all that comes with the position. Both Carl Philip and Madeleine can have a little bit more freedom in their choices, in all areas. I have no problem what so ever with that. In fact, I think it would be more strange if all three siblings were more similar. It's nice to see them find their roles, personalities and place in life. I think choosing ones life partner is a very different matter than wearing a national costume, don ´t you think?! And abstaining her right in favour of her brother would have been turning against a decision the swedish parliament has made! All true but I was countering Ms Lennmor who claimed -with disapproval- that Sofia was less respecting traditions with her traditional dress and with African music. Victoria had more respect for tradition was claimed. Oh yes? A fitness trainer? Estelle as a Queen's name? Pop music during their wedding? All okay but do not claim that Victoria adheres tradition so much more than Carl Philip, come on. No one else as Victoria made the most un-traditional choice ever. All by all quite illustrative for Ms Lennmor's "niveau" of journalism. Ms Lennmor talking about a folk costume yes/no and claiming that Victoria upholds "tradition". Folk costume at the one hand. A fitness trainer at the other hand. If Victoria was so keen on traditions she would have abstained from her rights in in favour of her brother (wasn't it "tradition" until today's very day that the eldest son is King? ), she should have married a royal or aristocratic partner (it was never a "tradition" to see the fitness trainer as a Prince of Sweden) and if Victoria was so much more on tradition, why then "Estelle" as a name? Conclusion: Ms Lennmor was determined to write her "article" with vinegar and used far-sought futilities as "arguments". Victoria could not "abstain" from her rights. She is the heir to the throne by law and neither she nor her father have any power to change the law by themselves. In fact, the only situations where Victoria could legally give up her sucessions rights would be if she left the Lutheran Church of Sweden, or if she had married without the government's consent, or if she became the sovereign of another country without the consent of the King and the Riksdag. The Act of Succession does not allow for unilateral "renunciation" of succession rights, so my understanding is that, if Victoria were to give up get her place in the line of succession, the Act of Succession would have to be amended, which is a non-trivial process since the Act of Sucession is considered a fundamental law and, therefore, is subject to a qualified amendment procedure. On the Christening itself, I am not a fan either of pop music in church services, but Swedish posters like Xenobia have mentioned before in these forums that pop music is now common in Church of Sweden services. If their church is OK with it, I don't think it is up to me to question their music choices. I didn't particularly like the folk costume either and I wish Sofia had chosen a more conventional attire, but I am pretty sure she cleared her wardrobe choice first with the Royal Court and, somehow, they must have thought it would be politically wise to wear it. Sorry but I don't think its even possible to compare one christening to another....its like comparing one sibling/child to another, even twins are each of their own persons and personalities. Just as are the events. And TBH I'm getting a little tired of this constant "Estelle was great as always". I guess it may start to look like there's been too many of the christenings lately in the SRF (6 till now, 7th in spring/early summer 2018) but as the siblings have had their children so close to each other, then there's nothing to be done about it. Perhaps some think they could have cut down on the openness of the christenings of Madeleine's and Carl Philip's children? Its their right but I am definitely very grateful that we get to be "part" of all those chistenings too thanks to the broadcast and pictures from the church. All of the christenings have been dignified, beautiful and solemn events imho and I'm sure there will be longer wait for the next christening after a couple of years. There should be another Christening for Maddie next year...I forget when she is due! I see that my original post was deleted (which I can now sort of understand), so I try to keep it more civil now. It's just that I find the continued pointing the arrow towards Sofia and how she doesn't respect tradition etcetera (fill in whatever "necessary") very tiresome. Especially when Victoria (and her family) is dragged into everything for comparision and treated like an angel no less almost like a saint who can do no wrong. Both women are neither, they are human, so both women make mistakes. I believe it would be wise if this comparision stick horse is left at home every once in a while. That was my final take. 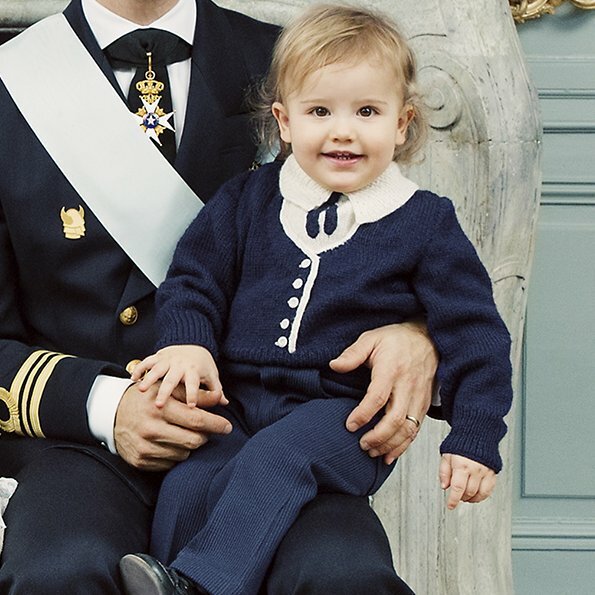 And I believe that I am in love with Prince Alexander, what a cute little guy! Regarding the, to foreigners, somewhat odd choice of music at services in the Church of Sweden I was at a funeral this Friday that started and ended with instrumental versions of two pop songs from the 70s by respectively Kim Larsen and Cornelis Vreeswijk. In between during the service were two hymns, some instrumental music as we approached the coffin and then a choir sang a hymn and the Swedish song that participated in Eurovision 1988. This kind of mix is what's become traditional since the 1930-40s onwards and it would even be odd to most Swedes not to include some songs that reflects your personality. I myself was very surprised when the forums almost imploded during the wedding of Sofia and Carl-Philip because of their choice of music. I hadn't realised it was so different from how it's done in other churches. The priest can say no if he or she feels that it's not a song fitting for a church but as I've never heard about that happening since people in general know there's a line somewhere. Funny but even thought I live in Estonia, I haven't heard that prince Carl Philip has been approached by Estonia to be its king. For something like this we would have to change the constitution because Estonia is a parliamentary republic where the President is a ceremonial figurehead. So we do not have much use for some foreign prince/princess. Besides Estonian constitution avoids concentration of too much power in one person's hands due to our history. I guess this "proposal" for prince Carl Philip was meant as some kind of a joke and even thought Estonia and Sweden have good relationship and lots of joint history, there's no possibility for Carl Philip and his children to rule in Estonia (both Carl Philip's sisters have visited Estonia but don't know if he has ever even been to Estonia). In 2018, the Republic of Estonia will celebrate its 100th anniversary, so should some Swedish royal want to visit, he or she would very much be welcome! Thanks for chiming in from Estonia. Concentration of too much power in one person's hand shouldn't be an issue as the Swedish King himself is probably the most ceremonial, least powerful of all monarchs (at least he is typically mentioned as an example), so if the people would want a ceremonial head of their country without any real power, the Swedish model could be adopted and CP should be fine with it. 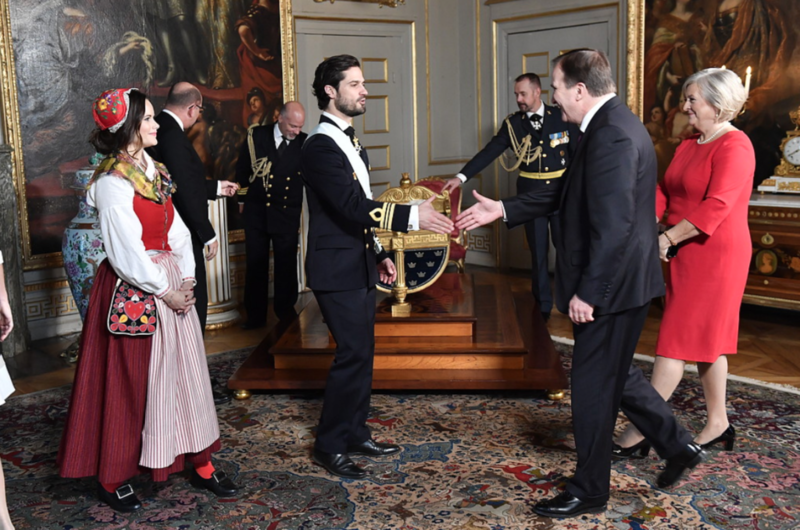 Carl-Philip was offered the Estonian throne by a local royalist association. The Court didn't comment on the offer and once it had been in the Swedish papers for a few days it all died down quickly. I don't think anyone took it seriously. Madeleine is due in March 2018, so the christening will be some time around late spring/early summer of 2018. There could be more christenings in next few years should e.g. Carl Philip and Sofia have a third child. Heck Maddie could have more children too! Wonder why they don' t show Gabriel' s full face. Did you actually watch the christening? Because you do get a good look over his face when the archbishop was holding him over the baptismal font, and there's nothing wrong with him at all. He's an infant, not a model, so he's not going to be posing for head shots anytime soon. Prince Alexander has got such a happy disposition. Oh Gabriel is sweet! What a happy little guy. Alexander always seems so cheerful and content too, they are precious. Thanks for the photo, polyesco. I would love to see a picture of the two young princes together. Aw, such a sweet; cheerful photo of little Gabriel! 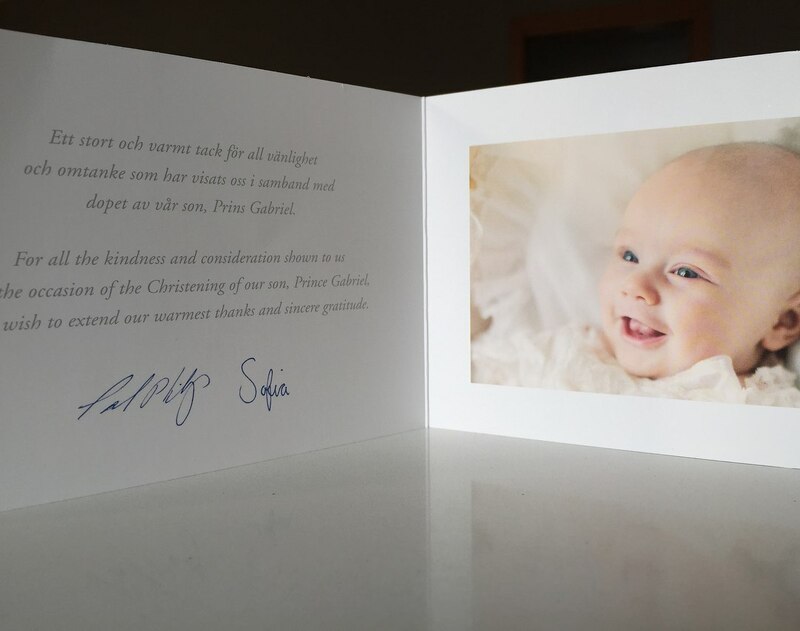 I always think it's nice when royals release unseen photos in thank you messages. Gabriel looks a lot like Sofia (who also, on a trivial note, has lovely handwriting) there.